Olive oil, vinegar bottle, wine pourer is a new stylish, bring convenient to your life, bring health to your food, 100% stainless steel tube spout guarantee will not rust, long time warranty. You get precise flow control and also help prevent those unwanted drips and spills. Additionally, the drop stop leak guard prevents spillage so that you get to enjoy every single drop. Metal construction with natural cork inserts. Enjoy our product. This Bottle Pourer is an Art in Home design product. It is made to import comfort and ease in your home. Do not spill any more liquids from bottles. Enjoy our great product! Simply open the bottle, attach the Wine, Oil, Vinegar Free Flow Pourer to the bottle. 18/8 stainless steel tube with cork stopper, Olive Oil, Vinegar, Wine Bottle Dispenser. 100 Leak proof food grade contact. 0.70 - 0.78 inch bottleneck. Most classical bottle are available, most of olive oil, vinegar bottle, red wine classical bottle. If you have any questions about this product by ART in HOME design, contact us by completing and submitting the form below. If you are looking for a specif part number, please include it with your message. 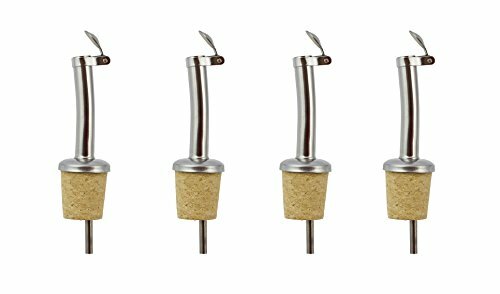 Professional Liquor Pourers Set of 4 by Barvivo - Classic Free Flow Bartender Bottle Pourer w/Tapered Spout, Fits Alcohol Bottles up to 1l. - Best for Pouring Wine, Spirits, Syrup and Olive Oil.